Observation - Great Crested Grebes courting - UK and Ireland. Description: Pair of Great Crested Grebes re-affirming their bond. They were not engaged in full courtship dance yet, but there was a lot of head-shaking, crest raised, followed by preening of the feathers. 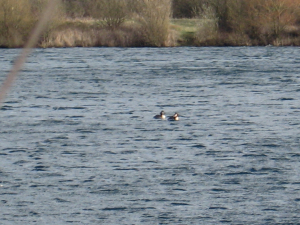 Pair of Great Crested Grebes re-affirming their bond. They were not engaged in full courtship dance yet, but there was a lot of head-shaking, crest raised, followed by preening of the feathers.